Work on Bahrain International Airport’s expansion project is moving as per schedule with the baggage handling system already installed successfully, thus representing a crucial phase in the construction operations of the airport, said a report. The new main passenger terminal is spread over a sprawling 210,000 sq m area, reported BNA. Once fully completed, the expansion project will increase the airport’s annual passenger capacity from 9 million to 14 million besides introducing 25 MARS airbridges and a state-of-the-art automated Early Baggage Storage (EBS) system, as well as a multistorey car park enough for an additional 2,700 vehicles, it stated. 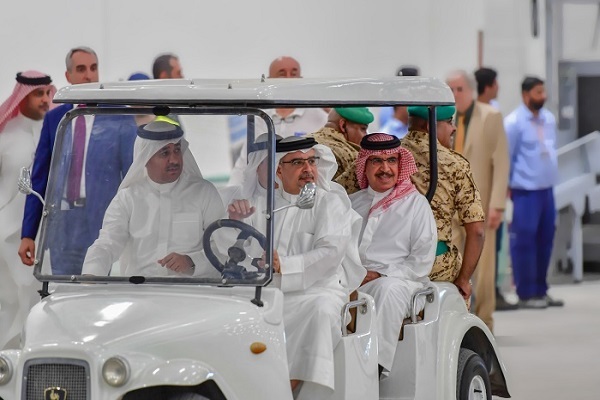 HRH Prince Salman bin Hamad Al Khalifa, Crown Prince, Deputy Supreme Commander and First Deputy Prime Minister yesterday (March 24) visited the Bahrain International Airport to review the progress of the Airport Expansion Project. Upon arrival, HRH the Crown Prince was welcomed by Deputy Prime Minister, Shaikh Khalid bin Abdullah Al Khalifa, and other senior government officials. He later toured different parts of the project and also reviewed the progress of the National Air Traffic Management Program (ORAT), which was recently introduced to ensure seamless operations across the airport’s new facilities and terminal. HRH the Crown Prince pointed out that, in line with HM the King’s vision to advance prosperity and development, the expansion will provide significant job opportunities for citizens, including a bespoke training programme (Tahleeq) designed to hone the skills of Bahrainis managing airport operations, reported BNA. HRH the Crown Prince also highlighted the important contribution Bahrain’s skilled workforce makes in expanding national assets for future generations and added that their dedication and commitment have been central to the success of the expansion project. Minister of Transportation and TelecommunicationsEngineer Kamal bin Ahmed Mohammed, expressed his thanks and gratitude for HRH the Crown Prince’s visit, saying that the visit reflects his commitment to advancing Bahrain’s thriving logistics sector. The minister said the work was moving at a steady pace on the new passenger terminal and stressed that it would be launched on schedule.